Images property of Diamond Hardwoods. Used with permission. 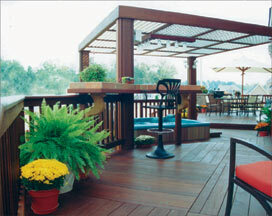 IPE (pronounced ee-pay) is absolutely the best decking material commercially available. 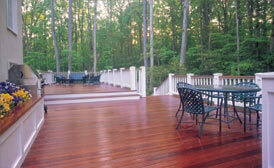 IPE's durability, natural resistance to decay and strength make it an excellent material choice for decking and outdoor furniture. This premium lumber product was formerly available to only architects and commercial builders, and is relatively new to the mainstream deck building market. We are so confident that you will like IPE, we will give you a free sample and information packet, including our direct mill pricing. We are a fully stocked IPE distributor and full service lumber yard that has been in business here in Old Bridge, New Jersey since 1918. We offer free delivery with minimum orders. 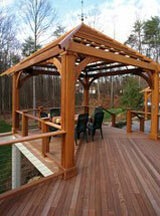 Contact us today for your IPE PACKET! 1 x 4 3/4" x 3 ½"
1 x 6 3/4" x 5 ½"
5/4 x 4 1" x 3 ½"
5/4 x 6 1" x 5 ½"
5/4 x 8 1" x 7 ½"
2 x 2 1 ½" x 1 ½"
2 x 4 1 ½" x 3 ½"
2 x 6 1 ½" x 5 ½"
2 x 8 1 ½" x 7 ½"
2 x 10 1 ½" x 9 ½"
2 x 12 1 ½" x 11 ½"
3 x 6 2 ½" x 5 ½"
3 x 8 2 ½" x 7 ½"
3 x 10 2 ½" x 9 ½"
3 x 12 2 ½" x 11 ½"
4 x 4 3 ½" x 3 ½"
4 x 6 3 ½" x 5 ½"
4 x 8 3 ½" x 7 ½"
4 x 10 3 ½" x 9 ½"
4 x 12 3 ½" x 11 ½"
(Rail Cap) 1-3/8" x 5-3/8"
(Rail Cap) 1-3/8" x 3-3/8"
Large Subrail 7/8" x 3-1/4"
Small Subrail 5/8" x 2"
Lower Rail 7/8" x 3-1/4"